“I aspire to pursue my studies in the medical field,” he said. Shivnesh scored the highest marks in the school (367 out of 400) in the Fiji Year 12 Certification Examination (FY12CE) last year." The student leaders of Tavua College with their head girl (seated left), Luisa Varani, and head boy (seated right) Shivnesh Prasad, after their prefects’ induction on February 8, 2019. Improving and maintaining student discipline will be the top focus for Tavua College head boy Shivnesh Prasad, who says the school’s prefects will work towards this goal this year. Shivnesh gave the assurance after the school’s prefects investiture ceremony held last Friday. 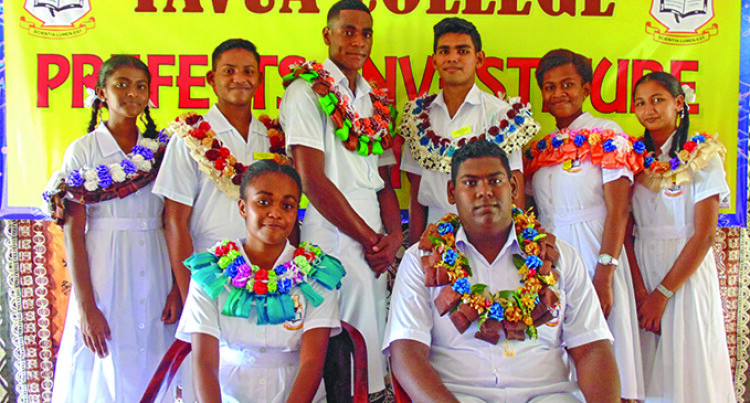 The Tavua College head boy said it was a big task, but he was confident that the school’s prefects will be able to achieve it. Shivnesh has also set plans for his future. “I aspire to pursue my studies in the medical field,” he said. Shivnesh scored the highest marks in the school (367 out of 400) in the Fiji Year 12 Certification Examination (FY12CE) last year. School principal Vikashni Sharma said she had faith that the students would apply their knowledge in carrying out the task given to them this year. “The school sees great potential in you and your investiture as student leaders is testament to the confidence that the teachers have in your leadership capabilities,” she said. The head girl is Luisa Varani. A total of 113 student leaders were inducted during the ceremony.